Thunder Wolves was relisted on Xbox 360 in January of 2018 according to reporting from TrueAchievements.com. As of this writing, it has not yet returned to sale on PlayStation 3. The original delisting information follows. 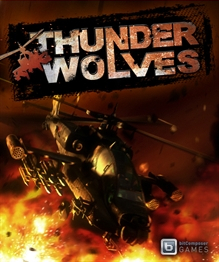 Thunder Wolves was last confirmed available on Xbox 360 on May 24th, 2017 and was delisted some time between that date and December 11th, 2017. The PlayStation 3 version of the game was likely delisted within this same timeframe. In August of 2015 the game’s Steam listing changed publishers from bitComposer to Nordic Games and eventually to THQ Nordic. The game remains available on Steam but has not reappeared on consoles as of December 2017. In Fall 2014 bitComposer Entertainment AG filed for insolvency protection after missing several game releases which put their financial standing in jeopardy. The company was dissolved in January 2015 but relaunched shortly after as bitComposer Interactive GmbH with new management and investors. According to bitComposer’s homepage several “major assets” and “name rights” were lost over the course of these events resulting in several delistings. Many of these titles have reappeared with new publishers but not on all of the original release platforms. See the list of titles published by bitComposer for more details. “The world is in danger! Diabolical terrorists are planning total destruction and absolute chaos. However, their plans fail to account for the Thunder Wolves, elite helicopter pilots who fight evil and defend law and order. Join the Thunder Wolves now—put yourself in the pilot’s seat, and get your helicopter airborne! Are you ready for explosive non-stop action? Then let’s go! 9 different helicopters and a large arsenal of different weapons! 13 action packed missions in 4 different regions of the world! Masses of enemies, diverse mission objectives, and spectacular boss battles!